In recent years, the ancient symbiosis between humans and their pets has entered a new phase, marked by the burgeoning clinical specialty of human-animal therapy. This approach uses the relationship between humans and their (mainly) mammalian pets to support the growth of emotion regulation, social skills, and mental health in children, youths, and adults. But how are humans and animals able to develop close bonds at all? What makes it possible for animals to have a therapeutic effect on humans? And how can we best use this understanding in animal-assisted therapy? In this unique book, a team of expert biologists and psychologists integrate and combine sophisticated biological and psychological knowledge to answer these questions. Together they have created a comprehensive, scientific foundation for human-animal therapy, a foundation that will facilitate the development, implementation, and evaluation of effective new interventions. “We all know that animals can help people heal from trauma, but these authors analyze the components of the healing process, elucidating them in biochemical, physiologic, and psychological terms. They provide a broad overview of the research that defines the value of therapy animals, as weil as a robust bibliography for extended exploration. This book is worth the read. "Helpful to those therapists who are considering integrating therapy animals into their practice [and] to us as practitioners working in a climate where evidence-based practice has become the norm. "Attachment to Pets not only reviews the research literature but also presents and explains a solid scientific rationale for the basis of human health benefits of companion animals and why Animal-Assisted Intervention can be successful. For these reasons, this is an important book for anyone who is interested in positive human–animal interactions, especially with companion animals, and for practitioners, such as psychologists, social workers, and educators, who conduct any type of animal-assisted intervention. An important contribution to the field, and I wouldrecommend that researchers and practitioners of Animal-Assisted Intervention read Attachment to Pets." "This is a fascinating book, and covers the literature in both an accessible and lively way and I would recommend it both for those who share their lives with animals and those who might use them in therapy. This is a relatively short book (less than 200 pages) but don’t take that to mean it is light on detail. It is packed with research evidence and I was impressed with the comprehensive way the authors had put this together." For full review see http://dcp.bps.org.uk/dcp/dcp-publications/clinical-psychology-forum/book-reviews/julius-beetz-kotrschal-turner-%26-uvnas-moberg-attachment-to-pets$.cfm. 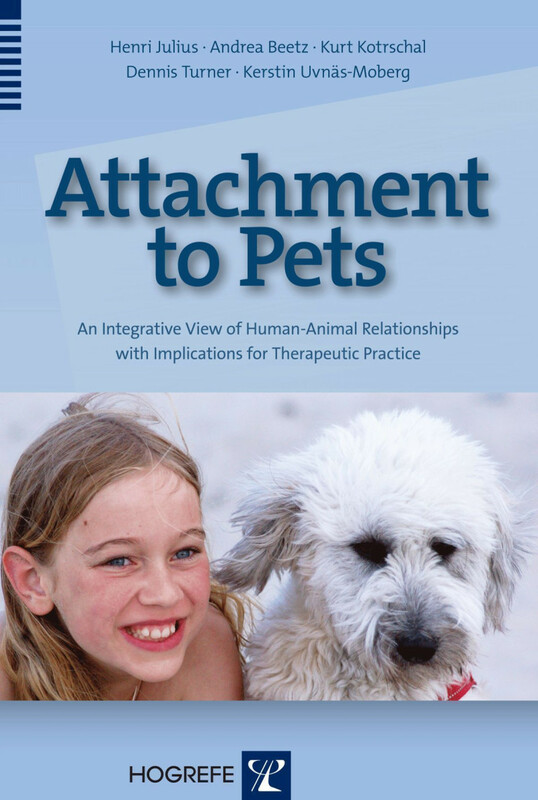 "Attachment to Pets presents an interdisciplinary view of the concept of attachment that is crucial to the understanding of human-animal interactions in the therapeutic milieu. [It] is the missing book that needed to be written about the importance of the oxytocinergic system in the attachment that humans may have withanimals. The authors are excellent ... The book is a helpful read for clinicians and an imperative readfor researchers, especially students interested in the field of anthrozoology. ... I discovered this book to be a much needed treasure [and] wonderful piece of scientific writing..."
"This book provides great insight into the human-animal bond, allowing for deeper understanding and broader application of animal-assisted therapy. "The authors accomplish a long-awaited merging of evolutionary, biophysiological, and psycho-logical processes likely to occur in human-animal interaction in an intellectually stimulating and practically applicable narrative. This book is useful for students, scientists, and practitioners, and will be essential to guide advancement of the field of human-animal interaction." "Attachment to Pets provides an in-depth discussion on the roots of our attachment to animals. The book helps conceptualize the rationale for our care taking of pets and provides valuable insights into the basis of animal-assisted therapy. The book is an excellent resource for the scientific community and policy makers studying human-animal interactions and, above all, for all those interested in using animals in a therapeutic context." "This much-needed integrative book explains how the relationship between animals and therapists/clients can effectively be used to provide animal-assisted interventions with positive out-comes. It also presents a valuable scholarly framework that advances the endeavors of the Inter-national Society for Animal-Assisted Therapy. The authors first analyze the physiology of attachment and caregiving, explaining the role of the autonomic nervous system and oxytocin, and go on to describe the evolution of behavioral systems and different types of attachment. Insecure and disorganized attachment patterns have adverse effects in which attachment and caregiving relationships are not fully developed. The authors then connect the attachment and caregiving systems to the neuroendocrine oxytocinergic system. They subsequently focus on the question of how human-animal relationships fit within these perspectives."